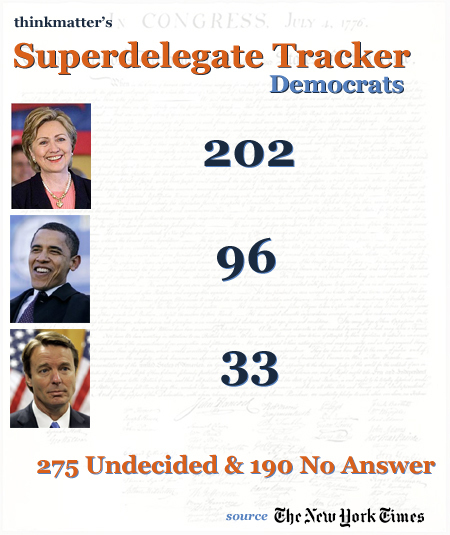 I’ve assembled a graphic for easy reference to the Superdelegate totals in the Democratic race. I still haven’t found reliable numbers for the Republican party’s ‘unpledged’ delegate total, so as soon as I find something credible, I have the graphic for you. Just one program note. I have switched around the navigation bar at the top of the page. Delegate Trackers for both parties are on one page, the Primary Calendars are on one page and (finally) the Superdelegate Trackers will be as well. The site is growing fast and I’m very happy to be keeping up with demand. Enjoy.